The Conners 3 with DSM-5 Updates is a thorough assessment of ADHD and its most common comorbid problems and disorders in children and adolescents aged 6 to18 years. It is a multi-informant assessment that takes into account home, social, and school settings, with rating forms for parents, teachers, and youth. The Conners 3 assists in the diagnostic process, helps identify students for potential eligibility in special education programs, assists in the development of intervention and treatment strategies, and monitors youth's response to interventoin and its effectiveness. The key Content scales include measures of: Inattention, Hyperactivity/Impulsivity, Learning Problems, Executive Functioning, Defiance/Aggression, Peer Relations, and Family Relations. 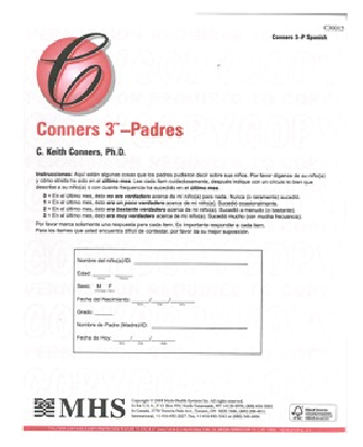 The full length forms for Parent, Teacher, and Self-Report, closely parallel each other and include every Conners 3 item.